Grigori Mints is one the most distinguished proof theorists of our time. He has contributed significantly not only to the subject in general but also to most of its applications. 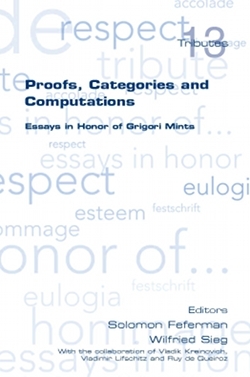 This collection of papers by a number of Mints' colleagues worldwide are both a personal tribute and a testimony to his breadth and importance by dealing with all areas in which Mints has worked: from proof-theoretical reductions through non-classical logics and category theory to automated theorem proving and proof mining, i.e., the extraction of mathematical information from formal proofs. The collection itself is significant for another reason: it bridges the two logical worlds in which Mints has worked, the world of the former Soviet Union and that of the West.